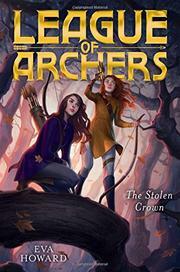 Outlaw Elinor Dray and the League of Archers are back (League of Archers, 2016). The residents of Lord de Lays’ lands are still suffering under the baron’s cruelty and greed. Many have been displaced from their homes and have joined a growing village in Sherwood Forest, aided by the League of Archers. A banquet for the king offers the perfect opportunity for Ellie to steal money to fund their new community. But when the king is murdered at the banquet, Ellie’s cover is blown, and she must rely on a strange boy—who turns out to be Stephen de Lays—to escape. Surprisingly, Stephen is keen to become a member of the League but soon shows his true colors, causing life-threatening problems, including rifts within the League. Meanwhile, Ellie feels the weight of caring for so many villagers, especially the mysterious young boy whom the League acquires in a botched robbery. Astute readers may ascertain the boy’s identity, which is not the only predictable element of the story. Ellie’s struggle to hold the League together, protect the villagers, and stay true to her beliefs in the face of dangerous Stephen’s charisma is sympathetic, while her propensity for impetuosity is less forgivable this time around, as is the lack of diversity in the very white cast. A highly unlikely ending tests credulity.